Zero gravity meets zero fear in this cosmic comedy-adventure about a summer camp where regular kids check in...and real astronauts check out! Starring Kate Capshaw, Lea Thompson, Kelly Preston, Larry B. Scott, Leaf Phoenix and Tate Donovan, SpaceCamp is a wild and wonderful thrill-ride packed with "special effects...spectacular moments" (Film Journal) and a "gripping climax" (Time Out Film Guide) that's out of this world! For five typical teens, NASA's space camp promises to be a fun way to blow off the summer. But when a space shuttle exercise misfires, they find themselves launched into orbit, facing the adventure of a lifetime. Now, the only way back to Earth is to take command of the ship and control of their destinies, before time – and oxygen – runs out! Decided to check this one out today. It is a part of my friends collection... and one I haven't seen since it was originally released on VHS. I remembered enjoying it quite a bit at the time... and time has not changed this opinion. This film easily kept my intrest from beginning to end. If you never seen this film I definitely recomend it. Hope to add it to my own collection. I've seen this a couple times...the first time might've been in the theatre. I have always liked it, not surprising since I like both Kate Capshaw and Lea Thompson. I think John Williams, my favorite film composer, may have provided the music for this also. I just watched Abbott & Costello in Little Giant. In this one Costello plays a country hick that gets a job selling vacuum cleaners. This one is pretty good... but far from the best Abbott & Costello film I have seen. It has a few good laughs in it... but not so much that I could recommend this one all that strongly. I would say average at best. Michael Keaton as Ray Peyton Sr.
Breckin Meyer as Ray Peyton Jr.
Start your engines! Lindsay Lohan (Mean Girls, Freaky Friday) does the driving when Herbie – the fun-lovin', freewheelin' '63 VW Beetle with a mind of its own – returns better than ever in Disney's all new, revved-up comedy adventure! Though a third-generation member of a NASCAR family, Maggie Peyton (Lohan) has always been forbidden from following her racing dreams by her overprotective father (Michael Keaton – First Daughter). But she has no idea her life is about to take a huge u-turn! After discovering the irresistible Herbie in a junkyard, they form a magical team that will save her family and rewrite the racing record books! With Breckin Meyer (Road Trip), Matt Dillon (There's Something About Mary) and an all-star cast along for the ride, you better believe ol' Number 53 has some new tricks under his hood! I picked this one up at the library today. I have always liked the old Herbie movies... and ths one is no different. Sure it isn't something that will go down in cinema history... but it is a whole lot of fun. And lets face it... sometimes that is all you need from a film. I think my favorite scene of the movie has to be Herbie in the demolition derby. This is one film I hope to add to my collection before too long. Based on true events, The Conjuring tells the thrilling story of ghost hunters Lorraine and Ed Warren (Vera Farmiga and Patrick Wilson), who help a family terrorized by an evil spirit in their mysterious farmhouse. Just finished watching this one. It is another one I recently got from the library. I enjoyed every minute of it... definitely worth the time put in to watch it.Though I didn't find it nearly as scary as people has told me it was. Sure there was a couple decent jump scenes... but that is about it. I am looking forward to adding this one to my collection before too long. 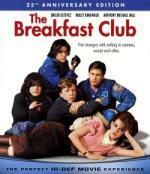 From writer/director John Hughes (Sixteen Candles, Weird Science), The Breakfast Club is an iconic portrait of 1980s American high shcool life. When Saturday detention started, they were simply the Jock, the Princess, the Brain, the Criminal and the Basket Case, but by that afternoon they had become closer than any of them could have imagined. Featuring an all-star '80s cast including Emilio Estevez, Anthony Michael Hall, Judd Nelson, Molly Ringwald, and Ally Sheedy, this warmhearted coming-of-age comedy helped define an entire generation! I just finished watching this one. It is one of the few well known '80s films that I never seen. And this one is really filled with well known stars. The one that surprised me... I would have never recognized him if they didn't say it in the trailer... is Anthony Michael Hall. I loved him in the TV series The Dead Zone. Anyway... I enjoyed every minute of this one. If you never seen this movie I haighly recommend it! I got this one from the library... so I am hoping I will be able to add it to my collection before too long! How is it possible that you hadn't seen this before? LOL... it happens. There is just not enough time in the day to see them all! Hugh Jackman returns as The Wolverine and faces his ultimate nemesis in an action-packed life-or-death battle that takes him to modern-day Japan. 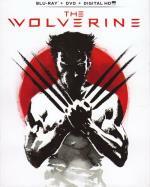 Vulnerable for the first time and pushed to his limits, Logan confronts not only lethal samurai steel but also his inner struggle against his own immortality; an epic fight that will leave him forever changed. This is another one I borrowed from the library. The first thing I did was watch the trailer for the film. Going by the trailer... I must admit I was a little concerned if I would like this one or not. But it didn't take long at all for me to get into the story. Before I knew it I was enjoying it quite a bit. Now compared to the other X-Men films... I must say this one is probably my least favorite. But don't take that wrong... this one is still well worth the time put in to watch it. I just prefer the others a little more. But this is one I hope to add to my collection before too long. Well, this is true. I am having that problem myself. It doesn't help that work is picking up. There's more action, more adventure — and more attitude — in The A-Team Extended Edition, which includes a never-before-seen version of the film with spectacular added footage not shown in theaters! 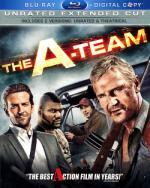 Convicted by a military court for a crime they didn't commit, a daring team of former Special Forces soldiers must utilize their unique talents to break out of prison and tackle their toughest mission yet...this is a job for The A-Team! This is the first time I ever seen this film... but I am a fan of the old TV series even though I haven't seen the series since I was a kid. Since I haven't seen the series in so many years I really can't accurately compare the film to the series. But what I can say is I had a lot of fun watching this film. There is a lot of great action and a few decent laughs along the way as well. I would recommend checking this one out. It is great for a couple hours of mindless fun! Mary-Kate Olsen and Ashley Olsen take their sister act to the next level with the delightful comedy New York Minute. Top student Jane Ryan (Ashley) heads to Manhattan for a college scholarship competition. Her rebellious twin Roxy Ryan (Mary-Kate) goes along to crash a video shoot. But anything can happen – and does – in a romp involving a pursuing truant officer (Eugene Levy), a smuggler (Andy Richter), hunkalacious guys (Jared Padalecki, Riley Smith) and the girls' realization that when the chips are down, a sister can be the best friend of all. I picked this one up used at a convience store a couple months ago. I picked it up cheap.. less then a dollar. Other then the Olsen Twins... this one also has Jared Padalecki (Supernatural). To be honest with you... when I picked this one up I really wasn't expecting too much from it. Then when I watched the trailer I saw some potential... but still didn't expect too much. After watching it I can say it had it's moments... but for the most part I have to say below average. Kinda the Olsen Twin's answer to Ferris Bueller's Day Off. As little as I paid for it... I really can't complain. But it isn't one I could recommend. Best I would say is if you are bored one day and can see this one for free.... well then there is worse things you can watch. But there is also plenty of better things that could be watched as well. I am over here trying to decide if I want to keep the above movie in my collection.... or if I want to trade it in. I am just not sure... I may or may not ever want to watch it again. And on the plus side... it does have some cast members in it that I like. And I do like collecting the works of certain actors and actresses. The studio that brought you Marvel's The Avengers unleashes the best Iron Man adventure yet with this must-own, global phenomenon starring Robert Downey Jr. When Tony Stark/Iron Man finds his world reduced to rubble, one question haunts him: Does the man make the suit, or does the suit make the man? 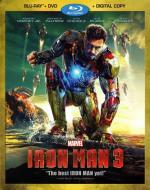 Featuring spectacular special effects, Marvel's Iron Man 3 explodes with exclusive Blu-ray content, including a Gag Reel, deleted scenes, a never-before-seen Marvel short film and a first-of-its-kind, interactive Second Screen Experience app hosted by JARVIS! Last night we all got together over here and watched their copy of Iron Man 3. This is the first time I got to see this one... and like the others I enjoyed it very much. Great film... lots of fun to watch. However... I will say this third one is definitely my least favorite of the three. I just didn't care much for a couple of directions the story took. Still well worth the time put in to watch it... a must see if you are a fan of the first 2 films. Johnny Depp (Sleepy Hollow), Mary Stuart Masterson (Bed of Roses) and Aidan Quinn (Practical Magic) star in this wonderfully unique and delightfully offbeat romantic comedy. With charm, humor and an outstanding supporting cast that includes Oliver Platt (A Time to Kill) and Julianne Moore (Hannibal), Benny & Joon is the perfect movie for everyone. I got this one used cheap. It is one I have seen before... but it has been so many years ago... it is like seeing it again for the first time. But going into it I did remember enjoying it the first time I seen it... which is about the only thing I remembered about it. The main reason I picked this one up is because I have been a Johnny Depp fan since his days on the TV series 21 Jump Street. I must say... this film lived up to my memory. I enjoyed every moment. In my opinion Johnny Depp stole the film. His character was a lot of fun. I would so get along with a person like his character. Some may say he is strange... but to me he just looks like a lot of fun. But this is more then just a funny film. It is also a very sweet love story. If you haven't had the chance to see this one yet I definitely recommend it.